WW-II Memorial is a monument dedicated to the memory of the struggle of U.S. troops during World War 2, that his site was put together other monuments in Washington DC. In 1994 President Clinton signed a stipulation which states that the location of WW-II Memorial should be in place between the "Washington Monument" and "Reflecting Pool", a giant pool of water in front of the Lincoln Memorial. This monument was completed and opened to the public in 2004 by President George W. Bush. In 1987, World War II veteran Roger Durbin discussions with Marcy Kaptur, a member of the senate of Ohio, about planning WW-II Memorial. 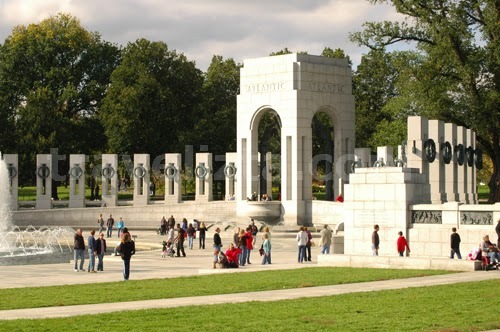 In September 1994, President Clinton appointed Memorial Advisory Board as an agency to select a location, designing the memorial, and raise funds for the realization of the monument. Largest founder of this project is a war veteran who is also Bob Dole presidential candidate, and Frederick W. Smith, CEO of FedEx. The monument was built with the purpose in honor of the 16 million people who participated in the U.S. armed forces during World War II, 400,000 of them died in the war. This monument is dedicated to the spirit, sacrifice, and commitment of the American people for the defense of the State and spreading world peace. 56th pillar in the WW-II Memorial is a representation of the 48 U.S. states, including DC, Alaska, Hawaii, Philippine, Puerto Rico, Guam, American Samoa, and the Virgin Islands. Pillar arch is a symbol of the Continent north Atlantic, and southern Pacific symbolize dimensional oval along 103 meters with a width of 73 meters, with an oval-shaped measuring 75.2x45.0m. 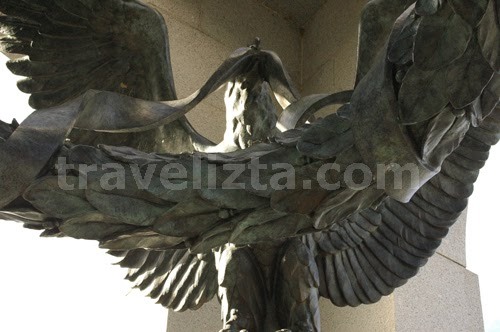 There is no public transport that connects the two areas on the National Mall monument complex, in addition to the tourist bus ticket price is very expensive. Visitors usually come down from the Metro station (subway), and walking distance to visit both places.